The Houston Astros are baseball’s best team at night’s end on May 9th. They’re absolutely on fire after an 8-3 easy breezy win against the Atlanta Braves at home. The guy a lot of people expected to be their best player is beginning to round into form. Carlos Correa smashed a three run homer to dead center to give the Astros an early lead, his fourth of the season. He would later rob his counterpart Dansby Swanson of a hit. Correa is at .263 with four homers and 15 RBI. Everyone was really in on the act tonight like a fine-oiled machine, with Charlie friggin’ Morton improving to 4-2 on the year with still a sub-4.00 ERA. 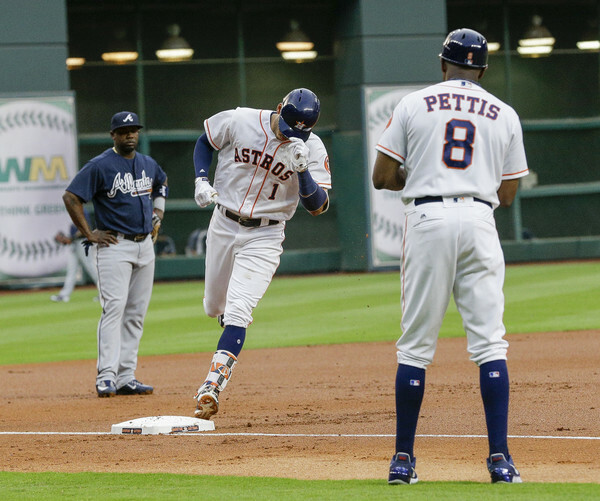 The Astros who are 22-11 also got home runs from veterans Carlos Beltran and Josh Reddick. They hung eight earned runs on poor old Bartolo Colon. Alex Bregman still hasn’t homered, but he did get a triple. If guys like Bregman and Correa fully heat up, the Astros are probably the best team in baseball going away. They’re scary good right now anyways. Next Story → Is Carlos Correa rounding into MVP Form?